Our Social Media Week in October, including Social Media Residency, the Summit and our Network Member Meeting. Our Call for Abstracts about practical uses of social media in health care. Transplant-related posts here on SMUG. I look forward to the discussion this afternoon! And of course, it can continue here and on Twitter! Chris Strouth needed a kidney transplant. He’d been on dialysis for months after Berger’s disease (which he called “Harold”) wreaked havoc on his renal system. So he tweeted about it, casting a wide electronic net with a plea to anyone he was even remotely connected to online. He got an impressive 19 offers, and one match — casual acquaintance and Facebook friend Scott Pakudaitis of St. Paul, whose left kidney, “William the Conqueror,” was transplanted into Strouth in December. Both are doing well, and the rest is Facebook history. Check out the rest of the story. I’m in St. Louis this afternoon for the Association of Organ Procurement Organizations‘ annual meeting. If you want to see what anyone is saying about this in Twitter, use the #aopo hashtag. Scott Meis and his blog, as well as the Donate Life Illinois group in Facebook. Our Mayo Clinic Transplant Games 2008 activity. A post that lists our various Mayo Clinic social media platforms. The “Octogenarian Idol” post that’s gotten lots of traffic via a viral video. Finally, here’s the page that tells you the various ways you can enroll in SMUG to get hands-on social media experience, and implement the 10 steps I outline in the presentation above. I’ve known Bob Aronson for nearly a decade, as I described here and here. As a heart transplant recipient, Bob is grateful for the additional years he has been given and has dedicated himself to promoting organ and tissue donation. And while his former career was in mainstream media relations, he’s taken to social media in his new vocation, with a blog called Bob’s NewHeart and a Facebook group as his main vehicles. Instead of responding by email, I thought it would be good to expand on my Seven Steps to Promoting Transplant through Social Media by adding some Twitter-related ideas, and also to throw it open to the SMUGgles for your additional thoughts. 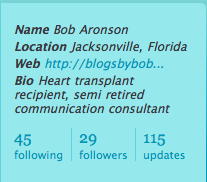 To Bob’s credit, he has started a Twitter account (@bobsnewheart), which is an important way to connect with people who have common interests, and who you don’t yet know. I described this process and gave an example in Twitter 130: Listening with Twitter. So here are my suggestions for how Bob can grow the Organ Transplant Patients, Families and Friends group in Facebook. And of course you can probably generalize the suggestions for particular applications you may have. First, make the Web link associated with your Twitter profile the one that is your top priority, and that is most descriptive of you and your mission. So instead of his blogsbybob.wordpress.com URL, I would recommend that Bob feature either bobsnewheart.wordpress.com or the Facebook group. Second, start Tweeting about Transplant. Look for interesting articles and news stories on Web sites, and do brief posts on Twitter about them. Do it every day. This will help people who come across your Twitter profile understand what you’re all about, so as you engage in the next steps, they won’t consider your a Twitter spammer. Third, apply Twitter 106 and Twitter 130 to your goals. Get Tweetdeck to make your interactions in Twitter much more efficient. Set up search tabs for “organ donation” and “transplant” as well as for Replies, Direct Messages and All Friends. Fourth, Engage in Conversations. When you see an interesting Tweet in your search tabs, use Tweetdeck to follow the person, reply and — if you think it’s particularly interesting — re-tweet the post to your followers. As you get to know the individuals, you can invite them to join the Facebook group. And you may find other valuable projects and initiatives with which you can connect. For example, you may find other people blogging about transplant that you can add to your blogroll; maybe they’re reciprocate. You may find other related Facebook groups that you would like to join. The bottom line: if you’re focused on creating or passing along valuable, interesting content and making connections among like-minded people, you’ll be successful. What other ideas do you have for growing a community?